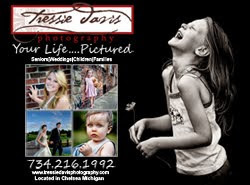 News From Tressie Davis Photography: Win a Free Mini Session!! Help me out by answering my survey, and if you give your contact info at the end you will be entered into the drawing for a free mini session! I will collect survey responses through June 7, 2008 and will hold the drawing between June 8-15. Thank you, and Good Luck!